U.K. Uncovers 'Advanced' Bomb Plot; U.S. 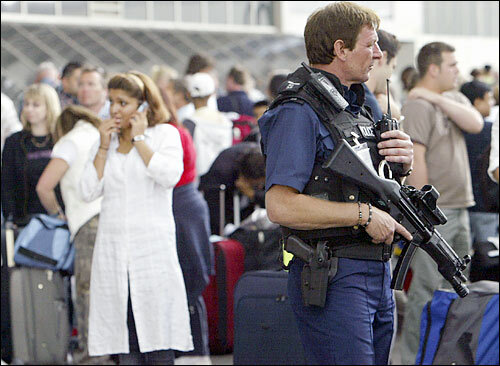 Targeted British authorities say they have thwarted a terrorist plot to simultaneously blow up several aircraft to the United States using explosives smuggled in hand luggage, averting what police described as "mass murder on an unimaginable scale." Chertoff: Plot was sophisticated, international and involved significant number of operatives. 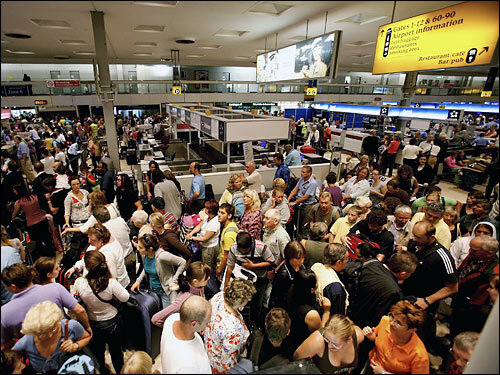 Chertoff announces temporary ban on liquids in aircraft cabins. He advises travelers to pack lightly. Attorney General Alberto Gonzales: "A vicious and determined enemy... is intent on harming American lives." 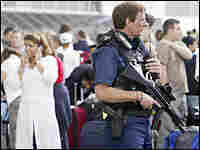 A policeman secures the area as passengers wait at London's Heathrow airport on Thursday after the announcement of a foiled terrorist plot. 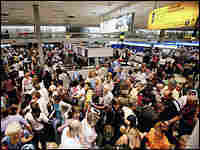 Passengers stranded at London's Heathrow airport.